REMEMBER ME? LOTS OF PICS!! Whew! It's been awhile! One of the parts of having puppies in the house that I forgot was the influx of people that come over. The little cuties will be 3 weeks old tomorrow. Already. It's going by way too fast, and I'm trying really hard to not think about them leaving for their furever homes. Thankfully this time I get to keep one, and I'm also super happy that Seven's owners have decided to get another Tinlee pup this time around. So my little dark blue ribbon boy, Ziggy Stardust, already is chosen. I, on the other hand, am still undecided on who to keep. It's a good thing I only have 2 girls to choose from because having more options than that would be impossible. At this point, my red girl, Queen B, is really trying her best to make me pick her. She is the absolutely smoochiest of puppies and is always kissing my whole face and trying to eat my nose. China Girl has thrown her hat into the ring, too, but I won't be able to decide for probably a couple more weeks. Regardless, they are all adorable. I wish I could keep them all. Seriously....what's not to love here? I actually have managed a couple of manicures over the past 3 weeks. Of course, in 3 weeks I have only left the house twice, so I'm not doing them very often. The base for this is an opalescent white by the Target exclusive brand, Defy & Inspire. I found this on a clearance rack, and it had no name on it, but I "think" it's Petticoat. Over that I used MdU Black and Uber Chic 10-01. I managed to snag a couple of those polishes on the clearance rack, and I really am a huge fan. Tyler was here for a week for Griff's 6th birthday and brought the topcoat with her. Just for kicks I tried it over a mani to see if it would smear the stamping, and I was pleasantly surprised that it didn't smear the black stamp, and it dried very quickly. The lighter orange here is Sinful Colors Skylark stamped with Mundo de Unas Orange. The design is from the Uber Chic 4-01 stamping plate. I was just in the mood for an orange. This one was actually the first thing I did after putting my nails back on. I had removed them for the birth of the puppies. I wanted something light so I chose Zoya Pandora. Within the first hour of painting my nails this color, I messed up 4 of them. My initial plan was to stamp on top of the pink, but I wore it, damaged, for like 5 days. When I finally felt like doing my nails again, I ended up taking it all off, starting over on all of my nails but painted them the same color all over again. I was just too tired from lack of sleep to go choose something and the Zoya was still sitting on my table. I did finally manage to stamp on them, though!! I used Fresh Paint Emma and Uber Chic 4-01 for the design. The Fresh Paint polishes stamp very nicely. Last Friday night we had Griffin's birthday party, and I've been hanging on to these Lego water decals for awhile. I finally decided to use them. It seemed appropriate since we gave him a couple of different Lego sets for his birthday. Griff thought they were pretty cool. I did the water decals over a base of Square Hue Monch, which is bright yellow. Right now I hear some movement in the puppy pen, so I'm guessing it's going to be time to do some cleanup and give some kisses. THE WAIT IS OVER - PUPPIES!!! My entire last week has been just getting ready for the puppies and waiting for the puppies. Her first due date was on Friday, and on Monday we took her to the vet to have an x-ray, hoping it would show us the number of pups. I'd be lying if I said I wasn't a bit disappointed at the x-ray because it only showed us 6 puppies. We left the vet and came home and hoped that maybe there were 1 or 2 pups hiding. I started keeping track of Tinlee's temperature over the next few days, knowing that once it dropped to around 98, I could plan on puppies arriving in 12 to 24 hours. Finally on Friday at 5 p.m. I took her temp and it was 98.2. I immediately took it again to be sure, and then the waiting began. The whole rest of the evening she did a whole lot of panting and was just generally uncomfortable. I spent my night trying to sleep in the recliner (trying being the operative word), and when I wasn't in the chair, I was sitting in the whelping box with her. She did the same thing with her last litter. When Kev got up, I went to bed for a couple of hours but then got back up to continue the waiting. I kept telling Kev he should go golfing because I thought he had plenty of time to do that. He finally decided late in the afternoon that he would go golfing. He literally said, "If we want her to have puppies, I probably should try to golf." He made it to the second hole of the course when I messaged him to come home because she was having contractions. I was delivering the first pup when he walked in the door 15 minutes later. Things went very smoothly and pretty quickly from that point. 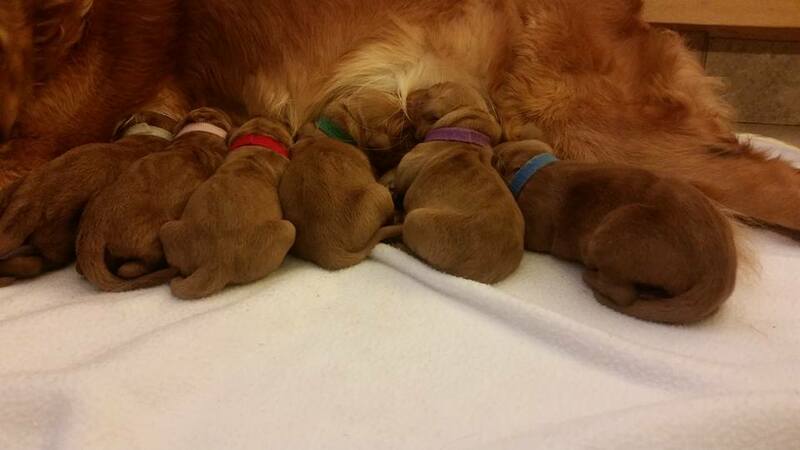 Her first pup was born at 4:56 p.m., and the last was born at 7:24 p.m. I'm happy to present Golden Grahams Diamond Dogs (a/k/a The Bowie Litter). My daughter again got to name the litter, and the pup's names are China Girl, Queen B, Major Tom, Ziggy Stardust, Starman and LDB (short for Little Drummer Boy). So here's just two quick shots of these precious little bundles. I couldn't resist this shot of puppy butts. Right now my Custom Nails are off since I removed them when Tinlee's temp dropped. I wanted my nails short in case of any birthing problems. I'll probably put them back on later tonight or tomorrow. Right now I'm too tired to care. I did this radial gradient awhile back. I use Square Hue Kewpies, Square Hue Tomorrowland and Sinful Colors Rose Dust for the gradient. I wanted a soft white stamping so I used Cult El Porto with a floral pattern from Uber Chic 9-01. I was a fan of this one. I didn't even do too badly of a job centering the design. I don't remember if I used a clear stamper on this one or not. Lordie, I really am suffering from brain fry from lack of sleep. Now I'm off to the puppy pen. The little stinkers were born needing their toenails clipped, so I'm going to deal with that. I'm sure over the next 8 weeks I'll post puppy pics. My live puppy cam is also up and running over on Ustream and you can find it here. I usually turn that on as soon as I think of it in the morning and leave it on until I go to bed at night. They'll be much more fun to watch a few weeks from now when they're running around. Guaranteed. This should be the week. The puppy pen is all cleaned and set up in my living room. I forgot how much I hate that thing in my living room. It sits in the only corner large enough which happens to be right in front of the door. Immediately after they brought it in, I remembered how much I hate not being able to open my front door. Thankfully the plan is to only leave it in that spot for the first couple of weeks. After that we are going to move it into the dining room so that the pups can run out of it right into the kitchen. I had a doctor's appointment in Green Bay last Thursday, and on our way home we stopped at the Goodwill store where I found four very nice baby blankets to use in the pen. I had also saved the old quilted couch cover that had ripped on the edge, so on Friday I cut that into four pieces and used my little $10 handheld sewing machine to stitch it up real quick. Not exactly a great looking or expert job, but I don't think the pups will care. Puppy cam stuff is all configured and ready to go, too. Yesterday Tinlee had an x-ray to give us an idea of how many we can be looking forward to, and it looks like there's 6 pups for sure, very possibly more. In other words, we'll find out when we find out. No cheating allowed. I was surprised at only 6 because she is huge compared to last time. I hope those puppies aren't gigantic. I want this to be as easy as possible for her. I've been taking her temp three times a day waiting for the drop so I can officially start Puppy Watch 2016. I'm ready now and won't be un-stressed until the pups are here. I lay in bed every night just thinking of things that could go wrong, puppy names, things I may have forgotten.....in other words, sleep is not really happening much. Between my mind not shutting off and hearing Tinlee's every move and panting, tired has been my word of the day for the past week. It's been two years since her first litter; I forgot about the no sleep part of all of this. With the July 4th holiday last week, I think I only painted my nails one time. Tyler was here with Griffin and Zero, and for whatever reason, Griff slept at our house almost every night that they were here. I don't usually waste time with nails when I have a grandson to play with. But I do have some to show you. I used China Glaze Aquadelic with MdU Cream for this one. I pretty successfully used a clear stamper and the Uber Chic 7-02 plate for the stamp. I'm still struggling with the clear stampers. I think I used the one from FabUrNails for this mani. This bright orangey-pink is QRS Sunshine Energy. It was actually a much brighter neon in person. I fully intended to stamp on this but simply never got around to it. I apparently was in a bright mood because after I took off that QRS, I immediately replaced it with this neon from KB Shimmer, Sarong Place, Sarong Time. The design came from my Dana2 stamping plate using Mundo de Unas Black. Now I'm thinking I'll clean the house. Kev is gone for just today, and then he's around for awhile, and it's always easier for me to clean when I'm here alone even though I do appreciate that he does the vacuuming if he's here. I had him bid to get the days off when Tinlee is due, and luckily he got off all of the days I wanted. Today he is gone to his annual physical in Green Bay and then is off to Madison to meet up with my fave of his pilot friends for a visit. I've been putting him to work around here getting things ready, so he deserves the break. I'm not sure where time goes. It's hard to believe that tomorrow is July 1st already. Retirement is a beautiful thing. I did work three days last week to fill in, and even though it was only about 15 hours total, I was not a fan of it. Getting up early to get ready for actual work was not something I enjoyed. I did enjoy seeing the bossman and doing some typing, but I got over it pretty quickly. Other than that, my days have been spent laying in the pool, cleaning, gardening, sitting with hummingbirds and getting ready for puppies. Tinlee is due in two weeks, so we are pretty excited about that. As absent as I've been on here, once the puppies arrive, I'll probably be even more missing in action. As I was sitting in the pool today, thinking about how lucky I've been to have so much time to be that lazy, it dawned on me that once the puppies are here, my days of lounging from 11 to 3 in the pool are probably over. I'm sure I'll sneak some pool time in, but it sure won't be like it has been the last two weeks. I remember with the last litter I was sad that I couldn't go sit with the hummingbirds as much, so I'm sure I'm going to run into the same issues this time around. Puppy breath trumps the pool and the hummers, though, so it's totally worth it. For now, here's some mani's I've had on over the past month or so. I'll list everything I used, but other than that, they are what they are. Cult The Roxy stamped with Cult Breakwater using Bundle Monster + Lucy's Stash BM XL-209 stamping plate. Sinful Colors Endless Blue stamped with Julep Tali. The design is from the new Uber Chic 10-01 plate. The light purple is Zoya Kendal, and I used the Cooi 035 stamping plate with Mundo de Unas Violet. The light blue is Fresh Paint Matte in the USA, stamped with Mundo de Unas Turquoise and a plate I got from Ali Express, XY-J13. I do have more manicures sitting around just waiting to be shown, so hopefully I'll actually post them at some point. When I look back at a couple of them, I'm rethinking even showing them. They were ugly when I did them; they've gotten uglier to me over time. I hope your summer is going as good as mine is!! Nothing too much happening around here for the past week. I did finally get two days in the pool last weekend, but so far this week the weather has not cooperated. Luckily the forecast for at least the next couple of days is great. Right now I have Seven. She has been here since about 4 o'clock and will be here until early evening tomorrow. She is dying to go in the pool. I had to make sure to lay a raft on the stairs so she wouldn't go flying in without permission. It's a good thing I did that because right after supper we went outside, and the minute I turned my back she was partway up the steps. Little stinker loves the pool so she is going to be one happy little girl tomorrow. It's hard to do nails when she's here. She spends most of her time depositing toys in my lap. I figured since I'll probably not get to doing anything with them for at least a day or two, I'd show a few in this post. This very bright pink is Fresh Paint Passion Fruit. I stamped on it with Mundo de Unas Tutti using my brand spanking new Uber Chic 10-03 stamping plate. I used one of my clear stampers to do this one, and it didn't pic up the design very well, unfortunately. It was way too late for a do-over. I actually was painting these around 2 a.m. the other night and told myself that I'd wait to stamp until the next day. Then for whatever reason, I totally forgot what I had just told myself and just kept right on going and did the stamping, too. By the time I got done it was almost 3 a.m., and I decided I simply did not care enough to worry about trying to improve them. This next one is from several weeks ago. I used Zoya Kelly for the dark gray base and stamped with MdU Light Gray and the Ali Express Cooi 030 stamping plate. I really want them to make more of these Cooi full image plates. They are really nice! My monthly Julep polishes came last week, and I loved all three that I received. This pretty coral is Julep Lindsey, and I decided I would stamp with a navy blue since the shirt I was wearing to bebop around town had coral and navy in it. I don't own a navy stamping polish, so I used Julep Marisa with my Uber Chic 5-03 plate. I have found that Julep polishes stamp very well indeed, and I loved the combination of the coral with the blue. So there ya' go. I might not be posting much, but at least I'm throwing a few here for you to see just so you know I'm not completely ignoring my nails. What a fun afternoon we had here today. I've had Razzie since Tuesday. He's going back home tomorrow. I figured while he's here he should have some sibling fun. Seven's owners aren't available this week due to some long work hours, but I was super happy that Major was able to come over. He hasn't been here in a long time, and it was awesome to see him. Out of my seven pups, he's the only one that takes after his daddy at all. He's very dark red, and his coat has lots of curls and is more wiry than his sisters and brother. He does have the same super sweet disposition that the whole family has, though. It didn't take too long for him and Razzie to get into some rough-housing. Lots of bright, white teeth flashing and snorting with tails wagging the entire time. So cute!! Tinlee doesn't pay too much attention to the pups anymore when they come to visit. Now that she's pregnant, that's just as well because I don't really want her to engage in any rough play right now. After Majorleft, Razzie ate his supper, and Tinlee's, and has been passed out ever since. Poor guy is tuckered!! The other night I decided I'd do something triple-stamped. My purple base for this is OPI Back to Reality....TV. It's a great medium purple. On top of that I used my Uber Chic 5-01 plate and stamped first with MdU Black. After the black I restamped with MdU Pink and then one more time with MdU Velvet. I've had this on for a couple of days and still don't know if I like it or hate it. It kind of looks like an oddly colored camouflage to me. Since Kev is home to help occupy Razzie, I'm hoping that I'll be able to take this off tonight and soak off these damn nails that have only been on for 16 days. I somehow managed to knock my right index nail loose when I was monkeying around in the garden last night. Only getting 16 days of wear is really annoying me. I've almost always gotten at least three weeks of wear time, more if I switch to dark colors to hide my cuticles. I'd kill to have a new set made. I'm not going to hold my breath on that, though. It's been well over a year since Custom Nail Solutions had full pink sets available. I wish some other company would start up something similar. At this point I'd absolutely jump on a new bandwagon.